Find Water Pumping Machine, Gasoline Water Pumping Machine, Water Pump Wp30 on Industry Directory, Reliable Manufacturer/Supplier/Factory from China. 1.Q:What is the Quality Warranty for the products? A:We offer 1 year quality warranty for all of our products. 2.Q:Where is your factory located? How can I visit there? A: Our factory is located in Taizhou City, Zhejiang Province, China, about 2 hours train from Shanghai . All our clients, from home or abroad, are warmly welcome to visit us! 3.Q:What is the material of your products? A: Only New material can be used for our products. Materials for Generator: 100% Pure Crankcase, 100% Pure Copper Wire Materials for Water Pump: 100% Pure Auminium Pump body and Crankcase 4.Q:What is Minimum Order quantity? A: MOQ 50/100 pieces for different products. You are welcomed to consult for details. 5.Q:How does your factory do regarding quality control? A: From the internal parts to the outside packing, we not only make standard quality test,but also think ahead for a better solution. Except company QC system, We have achieved CE & SONCAP certificate. Contact us if you need more details on Wp10 Water Pump. 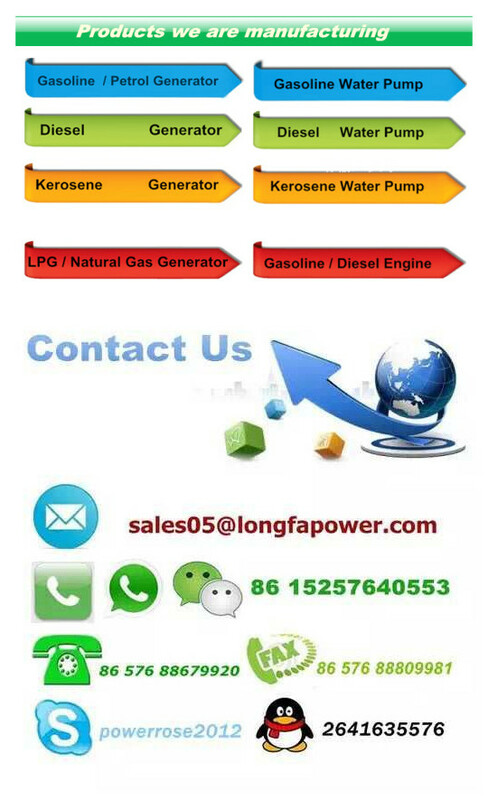 We are ready to answer your questions on packaging, logistics, certification or any other aspects about 1inch Gasoline Water Pump、Two Stroke Gasoline Water Pump. If these products fail to match your need, please contact us and we would like to provide relevant information. Copyright © 2019 www.gdgenerator.com All rights reserved.